The weather is so cold now and this is the season of the year many individuals go through an uncomfortable health condition known as chest congestion. Do you often suffer from chest congestion as a result of cold or other minor respiratory tracts infections? Have you been searching for some easy home remedies for dealing with chest congestion? Then search no further! These easy home remedies outlined in this article are very beneficial for dealing with chest congestion. Chest congestion is a common health condition often caused as a result of the respiratory system being affected mainly by cold or pneumonia. There are many causes of chest congestion such as Pulmonary edema, Asthma, Pneumonia, Cystic fibrosis, Heart problems, Lung cancer, Flu, Bronchitis and cold but a very common cause is cold. This compromised health condition is often expressed through a feeling of heavy pressure within the chest region as well as uncomfortable body state. When this happens, breathing tends to be very difficult with the flow of oxygen being restricted in the lungs. 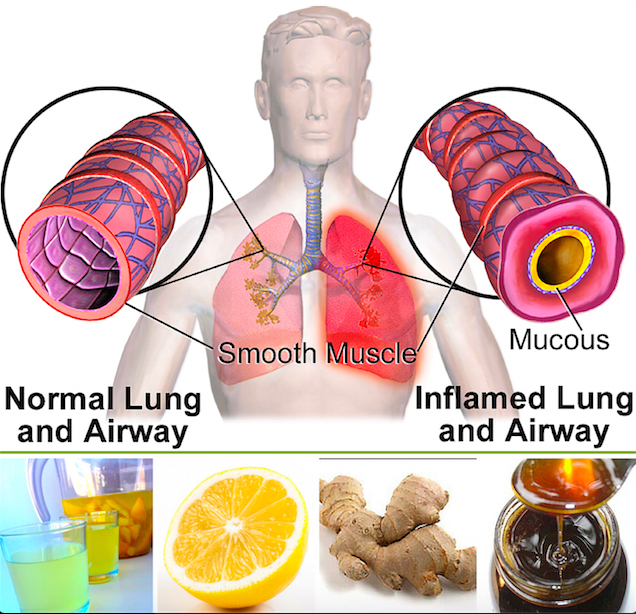 This restriction of oxygen and air flow tends to inflame the lower respiratory tract thereby causing an accumulation of fluids or mucus within the lungs region otherwise known as congestion. Chest congestion can be caused by bacteria or virus and a report by NHS UK states that individuals are infected when a carrier of these viruses and bacterias coughs or sneezes within the perimeter in which an healthy individual is located. Tiny droplets of fluid from an infected carrier are capable of infecting a healthy person during close contacts hence the need for proper hygiene such as proper hand washing. The body tries to expel the accumulated mucus from the lungs through coughing and this consistent coughing as well as restricted oxygen supply to the lungs causes an individual to always feel tired. Very common symptoms associated with chest congestion includes; breathing difficulties, chest pain, tiredness, runny nose, sneezing, chills, wheezing, fever, shortness of breath, body ache, and coughing. It is noteworthy that the presence of blood in the mucous while coughing can be a health threatening condition which necessitates the attention of a medical doctor. However, if all things being equal and your chest congestion is not attributable to any serious health condition, then you are free to treat yourself with some of the ingredients that are easily obtainable from your home otherwise referred to as home remedy. This is a common home remedy I personally enjoy doing because I usually kill two birds with one stone using this method, in the sense that this remedy serves two purposes for me at the same time. I learnt this remedy from my grandmother as a teenager and this technique has never left me rather I always look forward to it anytime I get cold. Although this method is very good for loosening up the lungs and chest thereby making the mucus and fluid to be expelled easily, it is also very helpful in opening up the facial skin pores thereby getting rid of excessive oil on the face especially for those suffering from pimples. This method is quite simple and it only requires pouring hot water in a clean bowl, adding some mentholatum, rub or mint oil into the hot water, placing your head over the hot water bowl while sitting in a comfortable position. Then place a thick towel over your head and inhale the hot steam consistently until you are tired of doing so. Personally, I inhale the steam until the hot water gets cold but it is up to you to choose how you intend to do so. But most importantly, this method is not suitable for kids and even adults should be very careful to ensure that hot water doesn't splash on their skin. Honestly, this method helps very well and is a great remedy for chest congestion. Boiling these three ingredients together and drinking the juice regularly greatly suppresses cold and chest congestion. This mixture helps in reducing the inflammation of the respiratory tracts due to the antibacterial and analgesic properties of the mixture. An article I have written in the past details how to prepare lemon, ginger and honey for treating cold. Read more here. Menthol and menthone according to Kalra et., al. (2011), are the major constituents of peppermint which are highly beneficial for treating cold, catarrh and cough. It renders anaesthetic action to the lungs and throats thus acts as a suppressant to chest congestion. Peppermint reduces inflammation, pain and clears chest congestion as well as promotes sweating hence highly recommended for treating chest congestion. Onion is so vital and also a very great home remedy for chest congestion. According to (Patil 2007), onion can be used for treating whooping cough, cold, bronchitis, asthma, respiratory problems and for loosening up lungs and chest congestion. Onions are very effective in minimising the thickness of mucus thereby boosting the removal of the mucus from the lungs and respiratory systems. Simply chew or boil the onions in a clean water with honey and then drink the juice everyday for great relief from chest congestion. The antibacterial and analgesic properties of eucalyptus oil makes it a good treatment for cold and chest congestion. Add a drop of eucalyptus oil in a hot water, place your face over it and cover up with towel. Then inhale the steam as much as you can for great relief from chest congestion. The vapour from the hot mixture gets to the lungs and then helps to decongest the lung for easy removal of mucus. This treatment method should be repeated severally throughout the day for a quicker result. Constant intake of hot water helps to loosen up the thick mucus caused by chest congestion. This greatly helps to extract the mucus from the lungs during coughing. Also taking a hot water bath relaxes the body as well as reduces the pain associated with cold and chest congestion. Increase in fluid intake helps to loosen up chest congestion. Fluid intake can be in the form of tea, juice, soups water, but preferably these fluids should either be warm or hot and not cold. These hot or warm drinks acts as a decongestant thereby helping to get rid of mucus from the respiratory tracts. According to Karla et., al. (2011), up to 20% of clove is made up of an essential oil characterized by the presence of eugenol, eugenol acetate and a- and b-caryophyllene. Clove can be used as a form of lozenges for sore throats and coughs caused by common cold. Clove is highly recommended for use as a remedy for decongesting the respiratory tract as well as for minimizing the issues of throat irritation. Summarily, prevention they say is better than cure so it is noteworthy that everyone should strive to avoid close contacts with infected persons as well as maintain a proper hygiene at all times. Always endeavour to wash your hands properly at all times especially after going out, shaking people's hands or handling things. These simple procedures will minimise the risk of catching the virus and bacteria that can possibly cause cold and chest congestion. This post is for enlightenment purposes only and should not be used as a replacement for professional diagnostic and treatments. Remember to always consult your health care provider before making any health-related decisions or for counselling, guidance and treatment about a specific medical condition. Patil M. V and Patil D. A. (2007), Some herbal remedies used by the tribes of Nasik district, Maharastra, Natural Product Radiance, 6(2), pp. 154-156. Kalra M. , Khatak M. , Khatak S. (2011), Cold and Flu: Conventional vs Botanical & Nutritional Therapy, International Journal Drug Dev. & Res, p.320.